View More In Binoculars & Scopes. In our daily life, we usually use earpick to clean the earwax for yourself or your child, but do you know how dangerous it is? Improper operation may cause hurting the sensitive parts of the ear. Our HD visual earwax clean tool attempts to reduce the chance of damage the ears when cleaning them, you can see current image of the inside ear without hurting your ear. This device adopts 1.3Mega pixel cmos, video resolution up to 1280*720p, it comes with brightness-adjustable 6 leds, which helps viewing clearly in dark area. Besides, it is also an ideal industry inspection endoscope for car testing, machine repairing, searching, observing, so on. 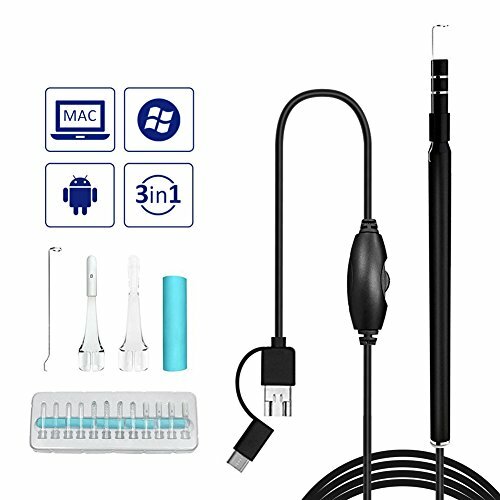 Safe Ear Caring Endoscope.This 3 in 1 HD USB ear cleaning endoscope will let you take a look at what's going on inside your ears and not hurt your ear, provides you with safer and better cleaning. Brightness-adjustable 6 LED Lights. The dia 5.5mm hd mini camera with built-in 6 leds allows observing and checking the inside of your ear much easier, cleaning earwax conveniently. Multi-functional Endoscope. This android endoscope comes with a full set of ear caring tools, perfect for anyone who suffers from earwax buildup. It is also suitable for daily checking skin, nose, throat, scalp hair root, more other body parts, pet caring, industry inspection, car repairing, so on. If you have any questions about this product by Eleshroom, contact us by completing and submitting the form below. If you are looking for a specif part number, please include it with your message.